EPA and DHA are two types of omega-3 fatty acids which can be created by the body in small amounts from ALA, another omega-3 fat. However, to obtain sufficient amounts, consuming them through diet or supplements is often necessary. A 3-oz serving of fish provides both EPA and DHA, but the amount of each varies between different species and even within specific subspecies in some cases. While the recommended daily intake of omega-3 fatty acids is between 1,100 mg and 1,600 mg for adults, the average intake of these essential fats are far less. Many fish are higher in DHA than EPA, yet all contain some of both fatty acids. DHA is more important than EPA in early brain development, explains the March of Dimes. Pregnant women, nursing mothers and young children may want to choose fish that are higher in DHA. Pacific sardines have 740 mg of DHA and 450 mg of EPA in a serving, more than 1 g of fatty acids combined. Atlantic salmon has 950 mg of DHA and 250 mg of EPA per serving. A serving of sockeye salmon has 600 mg of DHA and 450 mg of EPA. Rainbow trout has 440 mg of DHA and 400 mg of EPA in each serving. A serving of canned white tuna contains 540 mg and 200 mg of DHA and EPA, respectively. Canned light tuna has 190 mg DHA and 40 mg EPA per serving. 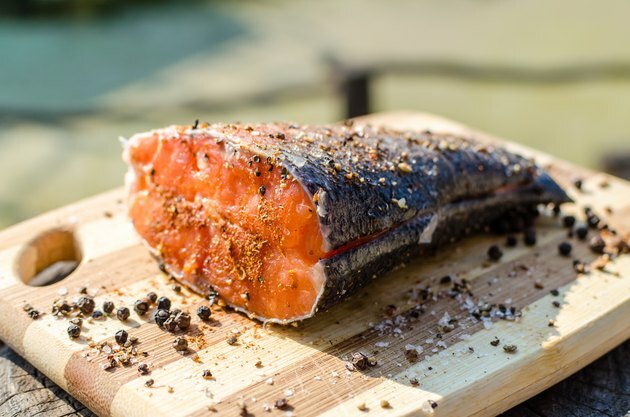 Some fish are higher in EPA than DHA, providing a different complement of specific fatty acids while still supplying high levels of omega-3 fats altogether. According to the University of Maryland Medical Center, higher levels of EPA may benefit people concerned with joint health or reducing bone loss and those taking topical corticosteroids along with the drug etretinate for the treatment of psoriasis. In 3 oz. of Pacific herring there are 1.06 g of EPA and 750 mg of DHA, a total of 1.81 g combined in a single serving. Chinook salmon contains 860 mg of EPA and 620 mg of DHA per serving. Eel and sturgeon also have higher EPA levels than DHA. In addition to fish, shellfish also sometimes contain high levels of EPA and DHA. Pacific oysters have 750 mg of EPA and 430 mg of DHA in a serving. One serving of Dungeness crab contains 240 mg EPA and 100 mg DHA. Shrimp, lobster, king crab, and blue crab are other seafood sources of EPA and DHA. Consuming sufficient amounts of fish to acquire EPA and DHA may expose the body to high levels of mercury as well since fatty fish are often contaminated with this potentially dangerous element. Pregnant women are particularly vulnerable to mercury from fish because it can damage the developing fetal brain. Atlantic mackerel, shark, swordfish, and tilefish are particularly prone to mercury contamination and should be avoided during pregnancy. Consuming 12 oz. of safer fish, such as salmon and sardines, can ensure sufficient EPA and DHA intake while still avoiding mercury. Individuals who cannot or choose not to eat fish may need to take supplements to get enough omega-3 fatty acids in the diet. Consuming supplemental ALA, prominent in flaxseed and walnuts, can provide the precursor molecule for making DHA and EPA within the body. Supplemental DHA and EPA are also available in the form of fish oil capsules. DHA produced by algae is another source of supplemental omega-3 fats.